Idaho Falls serves as the commercial, cultural, and healthcare hub for eastern Idaho, as well as parts of western Wyoming and southern Montana. It is served by the Idaho Falls Regional Airport and is home to the College of Eastern Idaho, Museum of Idaho, and the Idaho Falls Chukars minor league baseball team. It is the principal city of the Idaho Falls Metropolitan Statistical Area and the Idaho Falls-Blackfoot, Idaho Combined Statistical Area. The area around Idaho Falls was first sparsely settled by cattle and sheep ranchers, but no significant development took place until 1864, when a man named Harry Rickets built and operated a ferry on the Snake River at 43°36.112′N 112°3.528′W﻿ / ﻿43.601867°N 112.058800°W﻿ / 43.601867; -112.058800. The ferry served a new tide of westward migration and travel on the Montana Trail following the Bear River Massacre of Shoshone Indians in 1863. The present-day site of Idaho Falls became a permanent settlement when freighter Matt Taylor built a timber-frame toll bridge across a narrow black basaltic gorge of the river 7 miles (11 km) downstream from the ferry. The bridge improved travel for settlers moving north and west, and for miners, freighters, and others seeking riches in the gold fields of Idaho and Montana—especially the boom towns of Bannack and Virginia City. Utah & Northern Bridge, c.1880, looking north, or upriver, with railroad shops in background. By the end of 1865, a private bank, small hotel, livery stable, eating house, post office, and stage station had sprung up near the bridge. The settlement was initially known as Taylor's Crossing, but postmarks indicate that by 1866, the emerging town had become known as Eagle Rock. The name was derived from an isolated basalt island in the Snake River near the ferry, where approximately twenty eagles nested. In 1874, water rights were established on nearby Willow Creek and the first grain was harvested. Settlement was sparse and consisted of only a couple of families and small irrigation ditches. The first child of European descent was born at Eagle Rock in 1874. 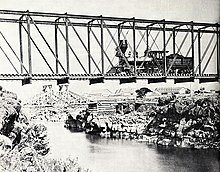 Soon, the Utah and Northern Railway (U&NR) was built, stretching north from Utah through Eagle Rock and crossing the Snake River at the same narrow gorge as Taylor's bridge. The railway would eventually connect to the large new copper mines at Butte, Montana. The U&NR had the backing of robber baron Jay Gould, as Union Pacific Railroad had purchased it a few years prior. Grading crews reached Eagle Rock in late 1878, and by early 1879, a wild camp-town with dozens of tents and shanties had moved to Eagle Rock with a collection of saloons, dance halls, and gambling halls. The railroad company had 16 locomotives and 300 train cars working between Logan, Utah at the once-quiet stage stop. A new iron railroad bridge was fabricated in Athens, Pennsylvania at a cost of $30,000 and shipped by rail to the site, where it was erected in April and May 1879. The bridge was 800 feet (240 m) long and had two spans, with an island in the center. The camp-town moved on, but Eagle Rock now had regular train service and several U&NR buildings, shops, and facilities, which expanded and transformed the town. As soon as the railroad came through, settlers began homesteading the Upper Snake River Valley in earnest. The first new settlers carved out homesteads to the north at Egin (near present-day Parker) and at Pooles Island (near present-day Menan). The Utah & Northern Railway provided easy access, especially to homesteaders from Utah, who soon populated much of the areas surrounding Eagle Rock. Some of these men had initially worked building the railroad, then later returned with their families to stake out new farms. These Utah families brought irrigation know-how developed in Utah's Great Basin settlements. Through their and others' canal systems, water from the Snake River made the Upper Snake River Valley into one of the most successful irrigation projects in the Mountain West. Large-scale settlement ensued and within a decade, there appeared roads, bridges, and dams, which brought most of the Upper Snake River Valley under cultivation. In 1887, following the construction of the Oregon Short Line and a railroad workers' strike in Eagle Rock, most of the railroad facilities were moved to Pocatello, where the new line branched off the U&NR. This caused a sharp and immediate drop in population, which nearly killed the town. In 1891, in an effort to attract farmers wary of eagles and rocks, marketers convinced town leaders to change the name to Idaho Falls, in reference to the rapids below the bridge. Some years later, the construction of a retaining wall for a hydroelectric power plant enhanced the rapids into falls. In 1895, the world's then-largest irrigation canal, the Great Feeder, began diverting water from the Snake River, helping to convert tens of thousands of more acres of desert into green farmland. The area grew sugar beets, potatoes, peas, grains, and alfalfa, and became one of the most productive regions of the United States. The city once again began to flourish, growing continuously into the 20th century. The Idaho National Laboratory, the University of Idaho, Idaho State University, Boise State University, and the University of Wyoming have labs, classrooms, offices, and other facilities just north of downtown. 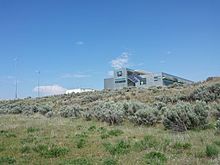 Among these partnerships is the Center for Advanced Energy Studies (CAES), shown here, which overlooks the Snake River. NRTS was the scene of the only fatal nuclear reactor incident in U.S. history, on January 3, 1961. The event occurred at an experimental U.S. Army reactor plant known as the Argonne Low Power Reactor, which the Army called the Stationary Low-Power Reactor Number One (SL-1). 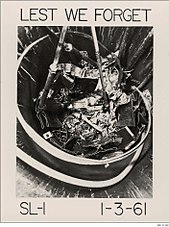 Due to poor design and maintenance procedures, a single control rod was manually pulled out too far from the reactor, causing the reactor to become prompt critical, and leading to a destructive power excursion. Three military, trained men had been working inside the reactor room when a mistake was made while reattaching a control rod to its motor assembly. With the central control rod nearly fully extended, the nuclear reactor rated at 3 MW rapidly increased power to 20 GW. This rapidly boiled the water inside the core. As the steam expanded, a pressure wave of water forcefully struck the top of the reactor vessel, upon which two of the men stood. The explosion was so severe that the reactor vessel was propelled nine feet into the air, striking the ceiling before settling back into its original position. One man was impaled by a shield plug and lodged into the ceiling, where he died instantly. The other men died from their injuries within hours. The three men were buried in lead coffins, and that entire section of the site was buried. The core meltdown caused no damage to the area, although some radioactive fission products were released into the atmosphere. The site has since developed into the Idaho National Laboratory (INL), a national laboratory operated by the United States Department of Energy. INL and its contractors are a major economic engine for the Idaho Falls area, employing more than 8,000 people between the desert site and its research and education campus in Idaho Falls. Among other projects, INL operates and manages the world-famous Advanced Test Reactor (ATR). Downtown - Historic downtown Idaho Falls sits on several blocks of the original townsite along the east side of the river. It features restaurants, plazas, shops, and cultural amenities including the Museum of Idaho, Colonial Theatre, Art Museum of Eastern Idaho, Idaho Falls Public Library, and Japanese Friendship Garden. It is home to the Idaho Falls Farmers' Market and many other community events. The Numbered Streets - The numbered streets area was the first planned neighborhood in Idaho Falls. The streets run west and east between South Boulevard and Holmes Avenue. Traffic on the odd-numbered streets travels east, and west on the even-numbered streets. Kate Curley Park is located in the neighborhood, as is the Wesley W. Deist Aquatic Center and the Eleventh Street Historic District. West Side - The West Side houses Idaho Falls Regional Airport and I-15. It has retained more of a small-town feel than the east side, which has grown and developed much more rapidly since the 1980s. As of the census  of 2010, there were 56,813 people, 21,203 households, and 14,510 families residing in the city. The population density was 2,542.0 inhabitants per square mile (981.5/km2). There were 22,977 housing units at an average density of 1,028.1 per square mile (397.0/km2). The racial makeup of the city was 89.3% White, 0.7% African American, 1.0% Native American, 1.0% Asian, 0.1% Pacific Islander, 5.6% from other races, and 2.3% from two or more races. Hispanic or Latino of any race were 12.9% of the population. There were 21,203 households of which 37.1% had children under the age of 18 living with them, 52.4% were married couples living together, 11.3% had a female householder with no husband present, 4.7% had a male householder with no wife present, and 31.6% were non-families. 26.5% of all households were made up of individuals and 9.7% had someone living alone who was 65 years of age or older. The average household size was 2.63 and the average family size was 3.20. The median age in the city was 32.2 years. 29.3% of residents were under the age of 18; 9.2% were between the ages of 18 and 24; 26.5% were from 25 to 44; 23.4% were from 45 to 64; and 11.8% were 65 years of age or older. The gender makeup of the city was 49.5% male and 50.5% female. The 2000 census  reported there were 50,730 people, 18,793 households, and 13,173 families residing in the city, though MSN real estate reports an area population of 110,220. The population density was 2,972.2 people per square mile (1,147.4/km²). There were 19,771 housing units at an average density of 1,158.4 per square mile (447.2/km²). The racial makeup of the city was 92.09% White, 0.62% African American, 0.76% Native American, 1.05% Asian, 0.06% Pacific Islander, 3.81% from other races, and 1.61% from two or more races. Hispanic or Latino of any race were 7.18% of the population. There were 18,793 households out of which 37.5% had children under the age of 18 living with them, 56.5% were married couples living together, 10.2% had a female householder with no husband present, and 29.9% were non-families. 25.3% of all households were made up of individuals and 9.1% had someone living alone who was 65 years of age or older. The average household size was 2.65 and the average family size was 3.21. In the city, the population was spread out with 30.3% under the age of 18, 10.1% from 18 to 24, 27.6% from 25 to 44, 20.9% from 45 to 64, and 11.1% who were 65 years of age or older. The median age was 32 years. For every 100 females, there were 97.9 males. For every 100 females age 18 and over, there were 94.8 males. The median income for a household in the city was $40,512, and the median income for a family was $47,431. Males had a median income of $39,082 versus $23,001 for females. The per capita income for the city was $18,857. About 7.8% of families and 10.9% of the population were below the poverty line, including 12.7% of those under age 18 and 6.3% of those age 65 or over. Idaho Falls serves as a regional hub for health care, travel, and business in eastern Idaho. The community's economy was mostly agriculturally focused until the opening of the National Reactor Testing Station in the desert west of Idaho Falls in 1949. The city subsequently became largely dependent on high-income jobs from the Idaho National Laboratory (INL), known locally simply as "The Site." Since the 1990s, the city has added a significant retail, entertainment, and restaurant sector, and a regional medical center. The Willard Arts Center, The Colonial Theatre and Civic Auditorium  host musical concerts, plays, and events. The Museum of Idaho  showcases local artifacts and history. It also brings in major traveling exhibits such as dinosaur bones, Gutenberg Bibles, Titanic remnants, and "Bodies: the Exhibition." Downtown Idaho Falls once struggled as the city expanded eastward, but it has been revitalized in recent years due to the efforts of local business owners, the City of Idaho Falls, and other organizations such as the Downtown Development Corporation  and the Idaho Falls Chamber of Commerce. Today, it is home to a handful of locally owned shops, stores, restaurants, galleries, theaters, and future revitalization efforts. Idaho Falls is home to a few higher education options, including College of Eastern Idaho. Originally established in 1969 as a vocational-technical college named Eastern Idaho Technical College, in May 2017, voters approved a measure to transition EITC into Eastern Idaho's only community college. Stevens-Henager College and University of Phoenix have also opened local resource centers in order to aid students in online degree programs. A unique satellite campus called University Place features dual enrollment for students in both Pocatello-based Idaho State University and Moscow-based University of Idaho. Students generally earn core classes at University Place and then transfer to ISU's or UI's main campus to finish their degrees. However, a few dozen degree programs, both undergraduate and graduate, are fully offered at University Place. The campus also boasts high-tech facilities such as the Center for Advanced Energy Studies (CAES). CAES is run by a partnership of Idaho's three research universities (UI, ISU, Boise State) and Idaho National Laboratory (INL). Idaho Falls is served by Idaho Falls School District #91 and Bonneville Joint School District #93. District #91 covers the majority of urban Idaho Falls and a small portion of Bonneville County west of the city. District #93 covers minimal parts of eastern Idaho Falls, and the remainder of Bonneville County with the exception of some remote areas that have independent elementary districts. All middle and high school students are transported in to District #93 secondary schools. Idaho Falls is home to eight public high schools, four public middle schools and 26 public elementary schools. It is also served by four public charter schools and three private schools. Each fall, the varsity football teams of Idaho Falls and Skyline compete in a rival football game called the Emotion Bowl. Each year, after the game, the winning team and its fans traditionally paint the goalposts of the stadium in their school colors (orange for Idaho Falls and blue for Skyline). Bonneville and Hillcrest participate in a similar event, known as the Civil War. The Post Register, a daily newspaper, serves the Idaho Falls area. The area is also served by 7 radio stations, 2 owned by local media group Sand Hill Media, and the Idaho Falls/Pocatello market is served by five major television stations. There are four major news outlets in the area; KIDK ( CBS, also broadcast on sister Fox station KXPI-LD), KIFI-TV ( ABC), KPVI-DT ( NBC, licensed to Pocatello), and Idaho Public Television. ^ "2016 U.S. Gazetteer Files". United States Census Bureau. Retrieved July 26, 2017. 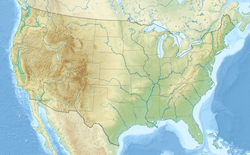 ^ a b "U.S. Census Bureau QuickFacts: Idaho Falls city, Idaho". U.S. Census Bureau. Retrieved September 13, 2018. ^ "Table 4: Annual Estimates of the Population for Incorporated Places in Idaho, Listed Alphabetically: April 1, 2000 to July 1, 2006 (SUB-EST2006-04-16)" (XLS). Census.gov. Retrieved 16 July 2007. ^ "Table 5:Annual Estimates of the Resident Population for Incorporated Places: April 1, 2010 to July 1, 2016". Factfinder.census.gov. Retrieved 26 May 2017. ^ a b MD Beal, A History of Southeastern Idaho, 1942, p. 218. ^ "idahohistory.net" (PDF). Idahohistory.net. Archived from the original (PDF) on 28 September 2017. Retrieved 25 August 2017. ^ Colorado Rail Annual No. 15, 1981, pp 31-39. ^ The Snake River Fork County, Louis J. Clements and Harold S. Forbush, 1972 pp 25-27. ^ Pioneer Pathways, vol. VIII, International Society Daughters of Utah Pioneers, 2005 pp 312-318. ^ LA-13638 A Review of Criticality Accidents (2000 Revision), Thomas P. McLaughlin, et al., Los Alamos National Laboratory, 2000. ^ a b Stacy, Susan M. (2000). Proving the Principle - A History of The Idaho National Engineering and Environmental Laboratory, 1949-1999 (PDF). U.S. Department of Energy, Idaho Operations Office. ISBN 0-16-059185-6. Archived from the original (PDF) on 2011-08-07. Chapter 15. ^ Stacy, Susan M. (2000). Proving the Principle - A History of The Idaho National Engineering and Environmental Laboratory, 1949-1999 (PDF). U.S. Department of Energy, Idaho Operations Office. ISBN 0-16-059185-6. Archived from the original (PDF) on 2012-11-01. Chapter 16. ^ Radiationworks. "SL-1 Accident - Idaho National Engineering Laboratory - The World's First Deadly Atomic Accident". Radiationworks.com. Retrieved 25 August 2017. ^ "Tornado History Project: 19780407.16.1". Tornadohistoryproject.com. Retrieved 25 August 2017. ^ "River Walk". idahofallsidaho.gov. Retrieved 26 November 2018. ^ "Idaho Falls begins improvement work on eastside River Walk". localnews8.com. Retrieved 26 November 2018. ^ "The Melaleuca Freedom Celebration". Melaleuca Freedom Celebration. Retrieved 25 August 2017. ^ "Climatography of the United States NO.81" (PDF). National Oceanic and Atmospheric Administration. Retrieved January 16, 2011. ^ "Monthly Averages for Idaho Falls, ID". The Weather Channel. Retrieved January 16, 2011. ^ "Idaho Falls - Idaho Falls - Ancestry & family history - ePodunk". Epodunk.com. Retrieved 25 August 2017. ^ "Businessweek - Bloomberg". Bloomberg.com. Retrieved 25 August 2017. ^ "Best Small Places For Business And Careers - Forbes.com". Forbes.com. Retrieved 25 August 2017. ^ "MONEY: Personal Finance News & Advice". MONEY.com. Retrieved 25 August 2017. ^ Rose, Peter (April 9, 1994). "Melaleuca expands into Canada". The Idaho Business Review. 13 (27): 10. ^ a b "10 low-cost locales where jobs are plentiful". Archived from the original on 2008-01-15. Retrieved 2009-05-04. ^ "Civic Auditorium". Idahofallsindaho.gov. Archived from the original on 10 February 2017. Retrieved 25 August 2017. ^ "Museum of Idaho". Museum of Idaho. Retrieved 25 August 2017. ^ "Idaho Falls Downtown Development Corporation". Idaho Falls Downtown Development Corporation. Retrieved 25 August 2017. ^ "Idaho Falls, Idaho, America's Best Adventure Towns -- National Geographic". Adventure.nationalgeographic.com. 9 August 2011. Retrieved 25 August 2017. ^ "Preparations for College of Eastern Idaho begin". Postregister.com. 17 May 2017. Retrieved 25 August 2017. ^ "Magnet High School at Clair E. Gale". New Tech Network. Retrieved 2012-04-22. ^ "2008 Great American Rivalry Preview: SKYLINE VS. IDAHO FALLS". iHigh.com. Archived from the original on 2009-06-16. Retrieved 2009-05-23. ^ Aprikyan, Tatevik (July 26, 2013). "Japanese students visit Idaho Falls for sister city exchange". Local News 8 of Idaho. Retrieved 17 November 2015. Wikivoyage has a travel guide for Idaho Falls. 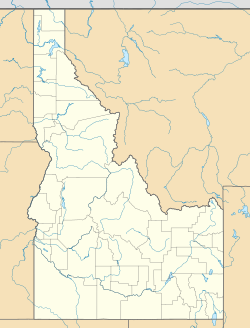 Wikimedia Commons has media related to Idaho Falls, Idaho. "Idaho Falls" . Collier's New Encyclopedia. 1921.